Gabriela Mini Storage opened in June 2009. We offer state-of-the-art facility security: Electronic gate provides 24-hour perimeter security plus 24-hour video surveillance and recording. 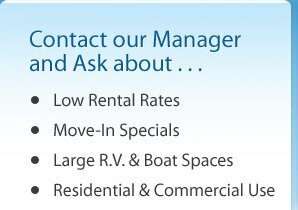 We offer flexible rental/payment options: Rent month to month, or long term. We accept cash, check, or credit card. Gabriela Mini Storage offers an RV Dump/Drain Station on the premises, available for use by tenants with recreational vehicles. Provide helpful advice on selecting the right unit size. Our brand new units were built with you in mind: Clean, Alarmed, and large roll-up overhead doors to make getting in and out a breeze. A variety of unit sizes are available, as well as temperature controlled units. Use our “choose your size” estimator tool or refer to our “What Fits” page to find a size to best suit your needs. We offer unit sizes from 5’x5’ to 10’x30’ and did we mention we offer Paved R.V. parking spaces from 12’x25’ to 12’x50’.